WELCOME HOME TO YOUR PRIVATE WORKING RANCH WITH LOTS OF GREEN GRASS, BLUE SKIES, AND LARGE TREES MAKING FOR A GLORIOUS VIEW! This ranch consists of over 35 acres with a breathtaking home, a rancher's dream barn and picture perfect landscaping. The home boasts a large entry way, comfortable living room with floor to ceiling brick fireplace, a dining room ready for your farmhouse table and a bay window to look out over the pasture, luxurious master suite together with a stone wrapped shower and a door leading out to your pool, spacious guest bedrooms, a functional laundry room with built in cabinetry, a bonus room that could serve as an office or 4th bedroom, and a kitchen perfect for large family gatherings. 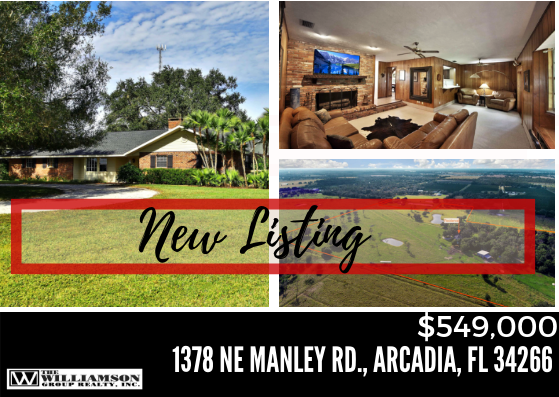 The exterior of the home features a sparkling pool, a circle driveway, beautiful landscaping, a garage a pond with a cleared nature walk way throughout the property and a 29x12 screened in lanai to enjoy Florida and to look over your sprawling ranch. The property is also fenced, cross-fenced and the barn includes multiple stalls, tack room, electricity and running water. If you are looking for privacy and a little piece of heaven, this may be the perfect ranch for you!